Blog Language is gratuitously binary- there is so much "more than this"
Three years to the day, I was pleased to see an old acquaintance, classmate, Steve Levitt, the coauthor of Freakonomics and to meet Sheryl Sandberg, author of Lean In, and the wife of fellow Harvard Class of 1989 alum, the late Dave Goldberg, CEO of Survey Monkey. 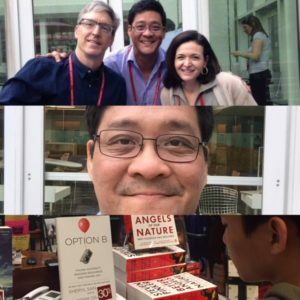 This collage shows the picture from three years ago with me between the two wildly successful authors, then me alone in the same spot now, writing this blog, and finally, my son today at the Harvard Coop bookstore in front of the Ms. Sandberg’s new book, Option B. While we can’t live live like Pixar’s Dory (the forgetful) fish, we also suffer when we remain stuck in a story that can no longer exist. From skin cells, to loved ones, to civilizations, a fractal truth emerges. Cells are born, age, and die as symbolized by the three Hindi deities of birth (Brahma), maintenance (Vishnu), and death (Siva). All of life is departure, torment, and return as I blogged about three years ago. I think it is possible that a significant lever of human suffering is the unconscious identification with our far too blunt tool of language. Language and by infectious association, thought itself, insists that the opposite of love is hate when it is actually apathy. Language tells us that the opposite of joy is sorrow when in fact it is closer to boredom. n. the feeling of returning home after an immersive trip only to find it fading rapidly from your awareness—to the extent you have to keep reminding yourself that it happened at all, even though it felt so vivid just days ago. 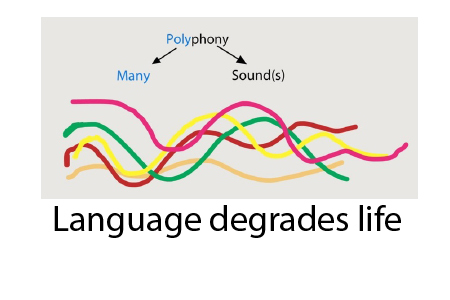 It strikes me that language opposition pairs must infect our minds with these silly false schemata. That is why I loved the sci-fi movie, Arrival. 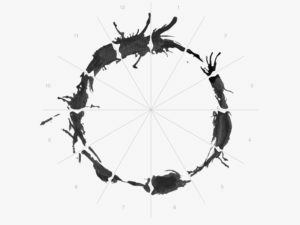 In it, the alien visitors’ language was comprised of non-linear pictographs which were liberated from dualistic language and even subject/object syntax; the language was out of time, closer to the true nature of human consciousness; our ‘remembrances of things past’ are the lens through which we view the present and envision our future. Perhaps one of high points in human civilization was the invention of Marcel Proust’s novel, À la recherche du temps perdu, which has been translated into the above phrase and also “In Search of Lost Time.” The novel hints at a feeling that I am trying to grasp in feeling young and old simultaneously. Still doing great. Very interesting experience so far… my dream consciousness access is entering my awake state. I am ‘seeing’ into my past and having revelations of understanding and using a lens of compassion to heal. Wow. Much more of a shift than I anticipated. Grateful for this moment and sharing my enthusiasm with friends and family. When a person is spiritually ready to embrace change in a healthy and constructive way, they can evolve in a rather punctuated way. Of course, if a person has no ability to remember and feel their past, they are functionally insane; so there is always helical motion in life. We think and live in circles with some propagated direction. Musically, the soundtrack to our inner lives would probably sound more like Indian music (with its quarter tones and non-adherence to Ionian/Aeolian dichotomy) or Igor Stravinsky, rather than Scott Joplin or Beethoven. It is fitting that Beethoven”s 9th Symphony, Ode to Joy, is constructed in a dominant and tonic (V-I) manner because mere consciousness finds the great ease in the greatest contrast. That brings me to why I mentioned “More Than This”. In music, the root of scale always seems to appear in the melody (e.g. in C-Major, you will hear the C played at some point.) 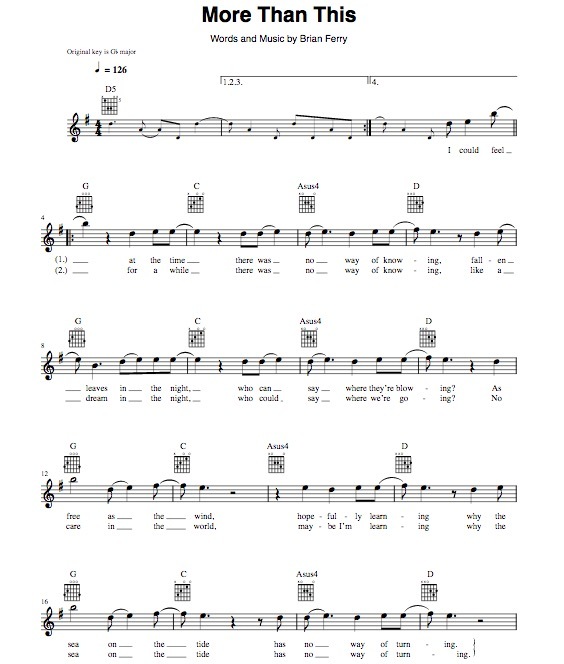 I find it interesting that in the melody of Roxy Music’s “More Than This”, the tonic doesn’t appear once, yet our mind’s ear elides past that and knows it to be a lovely and not all all contrived or uncomfortable tune. I was talking to a very successful composer whom I met recently and he told me that there must be many examples of this. To date, I know of no other, which I find both sad and a bit odd. But then again, how many novels like Remembrances of Things Past are there? In conclusion, perhaps a key to enjoying our lives more richly is to resist oscillating between known fixed intervals, binary language pairs, and oversimplified desires and regrets. Enjoy the present of our lives with its bittersweet polyphony and perceived dissonance. Revel in the knowing that the capacity of humankind to feel might be peerless among sentient beings in this universe. There is always “More Than This” in the music of living and dissonance is merely unresolved or overly complex consonance from a certain perspective. The richness of living derives from the wide range of simultaneous feelings, emotions, and remembrances that we are steeped in. Think on it: our demons might actually be angels; it is all just a matter of perspective. I know exactly how this applies to me. At 78 and having taken TA-65 for 8 or 9 years I (drum roll please) feel 18 some times. I don’t look 78, more in early 60s, and this is very confusing to ME! This reminds me of the teachings of Don Juan from the Casteneda books. Things that can have a word association are kind of things like objects on a table. But there are so many more things that cannot be named, yet still exist. The essence of Don Juan’s teachings is how to elevate your awareness of that part of reality.